100% organic extra virgin olive oil, cold extracted. Organic olive oil of French origin which, in addition to its nutritional value, has exceptional taste qualities. 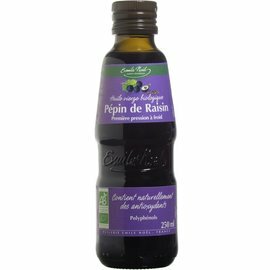 Extra-Virgin Organic olive oil of olives of the Petit Ribier and Calian varieties. 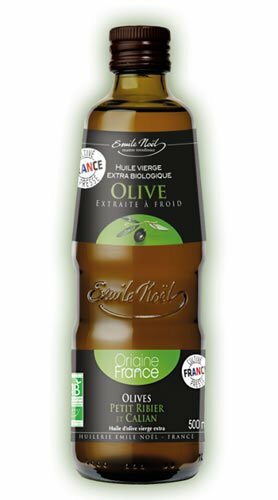 Organic olive oil of French origin which, in addition to its nutritional value, has exceptional taste qualities. This oil has a beautiful green color, dotted with warm yellow reflections with a fruity and intense taste. The delicious taste of fruit pulp stays in the mouth for a long time. The olives are stored for as short a period as possible (a few hours to a maximum of 2-3 days), then washed and sorted with water. The whole olives are cut and then ground to tear the cells of the fruit and in this way release the oil. This pure cold pressed fruit juice is untreated and manufactured at low temperature (30-40 ° C). This juice will then be converted into olive oil via centrifugation and separation of oil and water. 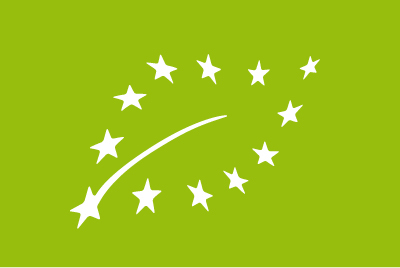 The name extra virgin olive oil is given to olive oil whose acidity is less than 0.8% (Legislation of the European Community). *NRV: Nutrient Reference Values. 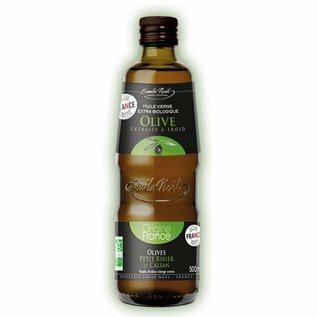 Contains 75 g of Omega 9 per 100 g.
100% organic olive oil extra virgin, cold extracted. Allergens: Gluten-free, Lactose-free, Milk-free, Nut-free, Peanut-free, Soy-free, Vegan, No added sugars. Emile Noël is much more than a name on a label with organic oil, passionate and demanding, he has dedicated his whole life to oil and today future generations have always adopted the same passion and desire to offer the best product. It is traveling around the world, always looking for new raw materials that are grown organically, that the oil mill has been able to develop an original and varied assortment with excellent flavors and nutritional qualities. The product is followed during the entire production process, from the raw material sample for the purchase to the storage of the end product. 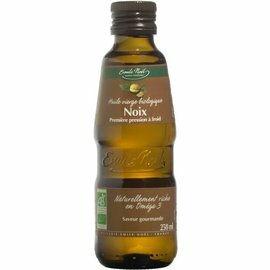 EMILE NOËL ORGANIC OLIVE OIL EXTRA-VIRGIN at NATURAL BIO STORE!